Next Job for X-37B Military Space Plane: Astronaut Ambulance? 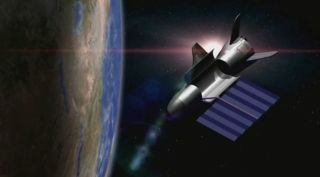 Artist's illustration of the U.S. Air Force's X-37B space plane in orbit. The United States Air Force's mysterious X-37B space plane would make a nice medical-evacuation vehicle for the International Space Station (ISS), some researchers say. The orbiting lab hasn't had a suitable astronaut ambulance since the retirement of NASA's space shuttle fleet back in 2011, said former astronaut Stephen Robinson, who flew on four shuttle missions and currently chairs the mechanical and aerospace engineering department at the University of California, Davis. The U.S. Air Force's robotic X-37B space plane is a miniature space shuttle capable of long, classified missions in orbit. See how the X-37B space plane works in this Space.com infographic. "If somebody needs to come home soon from space, coming back on the Soyuz is going to be a pretty challenging ride — at least 4.5 Gs, fairly violent landing, and then you might not be very close to the medical care you need out in Kazakhstan," he said last month during a presentation with NASA's Future In-Space Operations (FISO) working group. Indeed, one study indicates that Soyuz's "hard landings" actually injure healthy astronauts nearly 40 percent of the time, said Etan Halberg, one of Robinson's graduate students at UC-Davis, who also talked during the FISO presentation. Halberg said that an effective astronaut taxi should, among other things, be able to stay at the ISS for two years or more at a stretch; be capable of getting people back to Earth rapidly, within three hours or so; impose minimal G-loads on occupants; have the ability to land close to a hospital; and allow patients to lie in a supine position. These requirements all point to a space plane rather than a capsule, Halberg said — meaning SpaceX's Dragon capsule and Boeing's CST-100 capsule, which are scheduled to start flying NASA astronauts to and from the ISS within the next year or two, wouldn't make the grade as ambulances. Another private crew-carrying vehicle that's currently in development, Sierra Nevada Corp.'s Dream Chaser space plane, is an intriguing option that bears further investigation, Robinson and Halberg said. But their initial concept study focused on the robotic X-37B, chiefly because the 29-foot-long (8.8 meters) military space plane has already racked up millions of miles in orbit, while Dream Chaser has yet to launch. Exactly what the X-37B does on orbit for so long is unclear; the space plane's specific activities, and many of its payloads, are classified. Some people have speculated that the X-37B may be a space weapon of some sort, but the Air Force has always denied that idea, maintaining that the vehicle is just testing a variety of technologies for future spacecraft. Recovery crewmembers process the X-37B Orbital Test Vehicle at Vandenberg Air Force Base in California after the robotic space plane touched down in October 2014. The X-37B's payload bay would also be enlarged, from 88 cubic feet (2.5 cubic meters) to 147 feet (4.2 cubic m), to accommodate the pilot and two other people — the patient and a "crew medical officer." Furthermore, the medevac version would also use nontoxic fuel, as opposed to the currently employed propellant mix of nitrogen tetroxide and monomethyl hydrazine, Halberg said. But further details — such as where exactly the X-37B would land on its emergency missions — are sketchy. Turning the X-37B into an astronaut ambulance is just an idea right now, and there are no concrete plans to actually make it happen. "We started with the inside of the spacecraft, and we're now starting to work towards the outside," Robinson said.